As I approach the aquaponics system I can see it, standing there like the nose in the middle of the face… I was expecting a demanding mission with water analysis, fish examination but no. I expected a nitrate problem but no. 10 seconds of inspection and the response was standing in front of me! Everything went well at the beginning, he cycled the system and the fish were growing but after few months he lost one fish. Nothing unusual but few weeks after he lost another one, and another one, and another one. He finally lost all the fish. 2 weeks later he added few gold fish and they died as well. I organized a visit and when I approach the aquaponics system guess what I see… A METAL TAP! Yes guys this is something that I have probably not emphasize enough in my videos but we can’t use metal in aquaponics. When you put a metal in contact with water a multitude of reactions occur and ions are released into the water. Even if it’s stainless metal, at the long run the water toxicity will increase and kill your fish and even in certain cases arm your plants. We have to remember that in aquaponics we are working in a closed system so when a metal release some particles, even if it’s at a very low concentration, it will accumulate and reach the maximum limit of acceptation of your fish! The outcome of this video/article is: Avoid metals in aquaponics or you will expose your fish to serious issues in the long run. Can we use metal equipment in aquaponics? This is what we’re going to see together in this video. So a few years ago, I received a call from an aquaponics beginner who built his system and the system was working well until after a few months, it started to lose one fish and then it started to lose another one, and the following week, he lost two other fish and so on until he lost all his fish. So he tried again and he put a few more goldfish and the goldfish died. So he called me because he couldn’t find what was the problem. So before going there, I expected to see a problem of nitrate you know, toxicity in the water or a disease in the aquaponics system, something that could be a bit tricky to find, but I was there and I came there with my water test kit and I will share a bit of investigation, right? But when I arrived in front of the system, I could really see it straightaway what the problem was. So it’s related to the topic of this video, obviously. We are talking about metals in aquaponics. Can we add metal in the aquaponics system? In an aquaponics system you got two tanks, sometimes more and some people choose to use metal tanks. Also sometimes you know, you know you got the pipes from the pump to the grow-bed. Some people have tried sometimes to use metal pipes or even the tap, you know the valves, some people just recycle taps which would be a good idea to recycle things. But my recommendation is to stay away from any metal. When you put metal in the system, unfortunately, there are some reactions between the water and the metal. You know there is some oxidation but also the metal is going to release some ions into the water, and so the concentration of metal is going to increase slowly, slowly, even if you work with stainless steel, stainless metals because whatever the quality of the stainless is, it still breaks down slowly, slowly, slowly. So if it’s a big piece of metal, like if it’s a tank even if it’s stainless steel, it’s going to still release a significant quantity of ions into the water and the concentration of metal in the water is going to increase, and the fish are extremely sensitive to the metals, the algae as well. If it’s copper, that’s going to kill your plants. It’s going to kill your algae, if it reaches a certain concentration. So it’s always about balance, right? You know that the plants, they need metal to grow, right? I mean, they need mineral elements, and they need a lot of them and copper is one of them. They need it but in a very, very low concentration. But if you add a copper tap in your system, then it’s going to release some copper in the system but the problem is because we are in a closed environment, the copper is going to be released and it’s going to remain in the system, remain and always increase with time, right? So you’re going to reach some concentrations that are going to be significantly high and unfortunately, your fish are not going to be able to handle it — your fish, your plant, and your algae. So really, that’s what I recommend, is to stay away from any metal in your system. And back to my story at the beginning, when I arrived at this to this aquaponics beginner’s place and I saw the system, I could see that he put a metal tap in the system. So I simply asked him to just remove this tap and to put a new valve, a classic valve in plastic or PVC. After a few weeks, after a month, flushing all the water away obviously and after a month of system running again with a normal tap to try with some goldfish, and he did the experiment and the fish were able to survive without any problem. And after a while, he added other fish, and now he’s got the system running really well. So that’s a very simple advice. I think I haven’t emphasized these points enough. Really, stay away from metals. The only metal piece that you can have in an aquaponics system is the axle of the pump, you know, the water pump. When you got the rotor, it’s running around the axle, this one can be metal. Most of the time, I recommend to have it in ceramic. It’s much better because it’s harder. That’s my advice for today’s video. If you have too many fish or if you produce too much nitrogen for the number of plants you have, and if you use the water of your system to water your normal garden, then the concentration of metals in the water is not going to increase so much because you always remove some, but still, I would still recommend highly to stay away from metals in aquaponics. That’s the best for me, no metals in your aquaponics system. 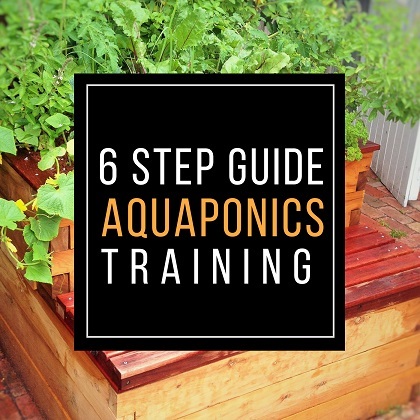 So if you are new to aquaponics and if you are trying to build your aquaponics system and to maintain it and to find the best advice, I give you a free aquaponics training from the description of the video just below. It’s a training where basically you can learn how to build a setup to know the limits, quantity of fish, the ratio between the fish and the bacteria, the size of the tanks, all those type of things. And also I give you some advice in the management of the system. So it’s free. Again, and it’s in the description of the video or in the ‘i’ like information in the corner of the video here or there. If you are new again, you can subscribe to the channel because I release one video every week to give you my best advice and to help you to grow sustainable, healthy, and tasty food in you aquaponics system. I’ll see you in the next video. Bye-bye.